As of today, a website that promised users beta codes to the yet-to-be-announced “Modern Warfare 4” has been taken down. The website went offline only after news of the scam, which operated on the domain name ModernWarfare4Beta.com, spread across the internet in the past 24 hours. A YouTube video apology posted earlier by Sn4gamers “claims” they hired a third-party to help grow their Facebook page, but were unknowingly victims of a scam themselves. Being a victim seems somewhat questionable, since the Facebook message stayed online for days before being deleted. The good news is, the site is now offline. The scam involved promising beta codes to “Modern Warfare 4” if users posted a link to the site to other game pages on Facebook, including the official Call of Duty Facebook page, which has more than 1 million likes. You can see screenshots of the fake beta site here and get an idea of what unsuspecting people encountered when visiting the page, now that nothing but an error page appears online. Sn4gamers also deleted a Facebook post encouraging users to visit the site and download the MW4 beta code. This isn’t the first time and won’t be the last time a fake beta website crops up online. Just last year, Microsoft took control of the domain names Halo4Beta.biz and Halo4Beta.net, after filing complaints against their owners. In January 2013, Take-Two Interactive Software, Inc, filed several domain complaints against the owners of Grand Theft Auto V beta domain names. The domain getgtavbeta.com has already been ordered transferred to Take-Two, while three other cases are pending that involve gtavbeta.org, betagtav.com and gtavbeta.net. 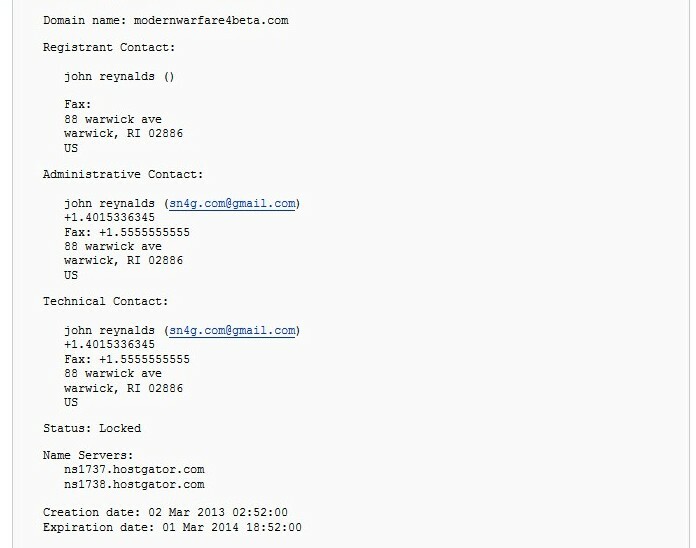 UPDATE 2 – March 5, 2013 – The WHOIS record has been updated from this to this. UPDATE 1 – March 4, 2013 – The home page of ModernWarfare4beta.com now displays the video explanation that was uploaded to YouTube. This issue has been resolved. Your statements are based off of nothing but speculation and no facts. We were blind sided by someone who we thought could benefit our Facebook group but sadly we were mistaken.